This year’s FIFA World Cup in Russia, saw industry-leading global broadcasters embrace the latest, most advanced innovations that change the way live sports coverage is created, distributed and viewed. Throughout the tournament, Brazil’s leading broadcaster Globo pushed boundaries and set new standards for live sports broadcasting by adopting Avid’s Maestro augmented reality solutions to produce the most compelling, visually-attractive graphical content. By collaborating with global TV broadcast services market leader, Gearhouse Broadcast, Globo’s creative vision to craft highly-engaging, immersive live sports viewing experiences became a reality. In order to captivate millions of dedicated soccer fans across Brazil, efficiency and creativity had to be at the centre of Globo’s FIFA World Cup operation. Gearhouse was selected by Globo to bring state-of-the-art production capabilities to its studio in Red Square, Moscow. Tested at Estúdios Globo, in Rio de Janeiro, and then at Gearhouse’s UK facility, the team dedicated their time to perfect the new system, ensuring it gave a faultless performance when it hit the ground running in Russia. By using Avid’s Maestro | AR suite of augmented reality tools, Globo’s team was able to create, insert and control captivating 3D virtual objects and graphics that look like part of the actual environment, as well as conducting real-time multiple image manipulation with virtually infinite flexibility. Avid Maestro | Designer was used simultaneously to import stills, video and graphics from third-party programs, and create and design fascinating 2D and 3D content. “With Gearhouse, we delivered an Avid Maestro solution that enables Globo to keep up with the fast-paced action on the pitch and create eye-catching graphics that boost ratings and engage viewers in exciting new ways,” said Tom Cordiner, senior vice president, Global Sales at Avid. Globo’s studio in Russia aired four live network news shows per day, and two weekly live network programs during the World Cup. It represents a major upgrade compared to its live sports production setup created for the Rio 2016 Olympic Games. 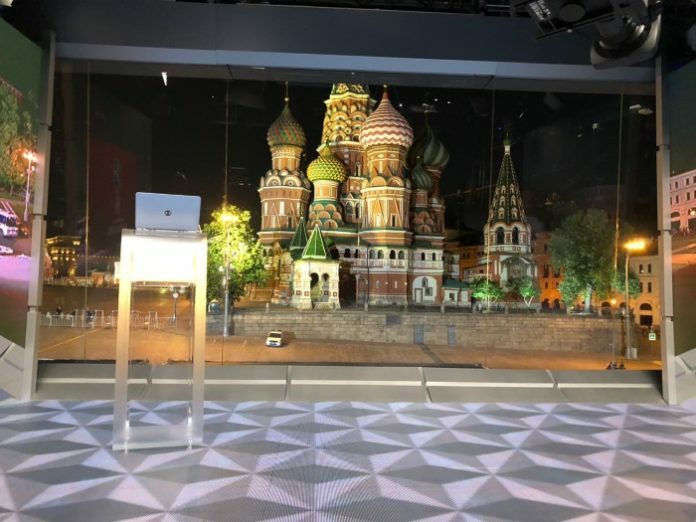 With no physical scenic elements in its new studio, Globo’s team relied on three giant LED screens, three fixed cameras pointed to Red Square, three studio cameras (being one on a crane, one in a dolly and one in a tripod) and nothing more.